Hibernation is a system state in Windows where your machine consumes least amount of power while being in a running state. When you hibernate the system, Windows saves your running programs and opened files and documents to the hard disk and turns your system off. This is useful when you want to save all your work in progress and easily returning to it afterwards. It consumes a minimal amount of battery and it can go for weeks in laptops with a good battery backup. Most of us would have never used it and will never use it. This is because today systems are fast enough and it just takes some seconds for a laptop to boot up. But hibernation takes up space on your hard drive if it is enabled and even if you do not hibernate your system. So disabling it will save some space (the space it takes depends on your RAM and can range from 50% to even 100% of your RAM size). 1. Open Registry Editor. 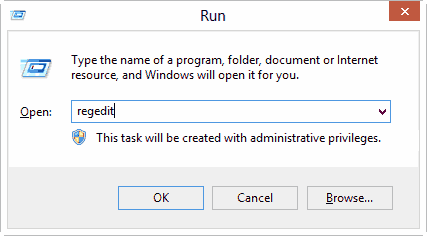 This can be done through the search feature from the start menu by typing regedit or by pressing Win + R and typing regedit and pressing Enter key. 2. 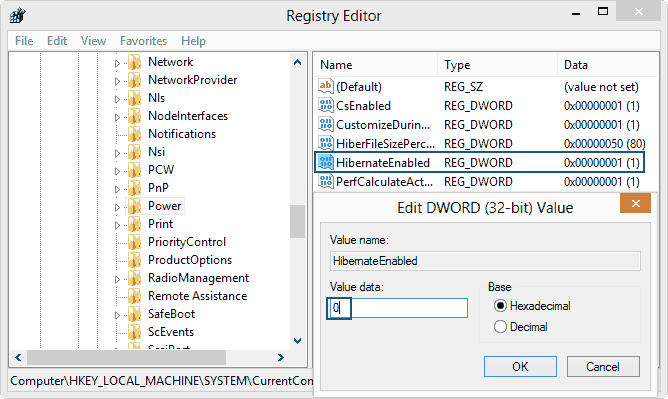 Now the Registry Editor window pops up. In the left pane you need to traverse to the path HKEY_LOCAL_MACHINE\SYSTEM\CurrentControlSet\Control\Power . 3. Double click on HibernateEnabled, change the Value data to 0 and hit OK and restart your computer. 4. If in future you need to enable the hibernation then just set this value to 1. That’s it. You have successfully disabled the hiberation in Windows 7. Now you will see a considerable increase in the free space of your Windows drive and also the hyberfil.sis file would be gone from your windows drive.